Life as a parent is a constant rush. With traveling back and forth from school, band and sports practices, trips to the grocery store, and obligatory family functions, it’s no wonder you’re always wondering where the time went. However, just because life as the energizer bunny is not all it’s cracked up to be, getting your family dressed and out the door doesn’t have to add to your workload. Make conscious, fashionable dressing decisions and teach your children a lesson in personal responsibility and individuality with these five tips on how to style your kids without spending hours playing dress up. It is no surprise that clothing stores hold big sales events as one season closes and another begins. Take advantage of these opportunities to stock up on clothing options for the next year, at a discounted price. For baby clothes, use this opportunity to buy clothes the next couple of sizes up to ensure you have options for months, and years, to come. When you’re shopping for kid’s clothing, consider layering. Layering adds dimension to any outfit. Choose clothes in different textiles and patterns to diversify closet selections. Layered clothing styles aren’t exclusive to girls. There are plenty of options out there for trendy boys clothing too. Encourage your child’s individual style, and let their personality play out in the clothes they wear. Set out of few staple pieces and let your child decide what to mix and match. Shop outside of the box! Yes, you too can dress your kids in trendy clothes, without breaking the bank. While you may not have the multi-million dollar budget some celebrities kids do, boutique shopping is still possible. Boutique doesn’t necessarily mean expensive; they’re just small stores that are not run by the megastore corporations like J.C. Penny’s or Target. Clothing in boutique stores have more creative freedom since large companies do not design them, so you can get diverse, trendy clothes that are relatively inexpensive. Explore children’s boutique stores as an alternative to superstores. When shopping for clothes for your kids, ask yourself, would you wear it? If the answer is no, don’t buy it! The last thing you want to do is fill your kids closet with clothes you’ll never dress them in. If don’t know where to start with styling your kids, peruse online stores for new ideas and price comparisons. You can also coordinate clothes with your children. Dressing similarly doesn’t have to be just for holiday postcards, nor does it have to be an exact match. Choose a color palette or style, and go from there. Not only will your kids look stylish, but you will look like a cohesive, well-represented family. You may even find yourself trying new style combinations from your own closet. 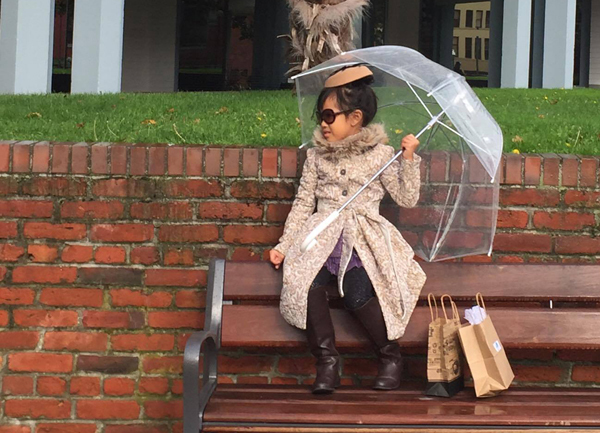 Styling your kids isn’t always about clothes. Pay attention to details like hair and accessories. You can make any outfit fun with a big pair of sunglasses. Complete a casual cool look with a messy bun or mussed up hair. When it comes to style, it’s the complete picture that pulls together a look, so don’t forget to consider the details when you’re dressing your kids. To dress your kids in style doesn’t require a big budget, a big closet, or endless amounts of time. Take the time to make wise purchases when there is a sale, plan for future wears, consider layers and different textures for endless outfit combinations, and pay attention to the details. Many thanks to Debbie Kee Balino for supplying the pictures in this article. Andrew Hoffman is a freelance writer and journalist from Los Angeles, CA, who has written on behalf of a range of clients including the Livestrong Network and Demand Media. In addition to writing about a range of topics, he enjoys playing basketball and cooking in his spare time. Great photos! Great advice! These looks are very inspiring!